I’ve got a new project going and I couldn’t be more excited. It’s for the Rock County Historical Society (RCHS), located in Janesville, Wisconsin. This non-profit society is no small potato. Yes, its hometown of 64,000 people is going through rough economic times, but the RCHS itself appears to be growing and thriving. So much so, in fact, they have a full time executive director, Mike Reuter, who guides support staff and volunteers in reaching out to the community—not just the city of Janesville, but all of Rock County. It was Mike who contacted me about an upcoming campaign. But let’s not digress. Let’s first talk about the RCHS and the fascinating history it preserves. The society is located on a 3.25-acre site and consists of six historical buildings, five of which are on the RCHS campus. The awesome building above is the Lincoln-Tallman House and is the highlight of the society’s architectural collection. 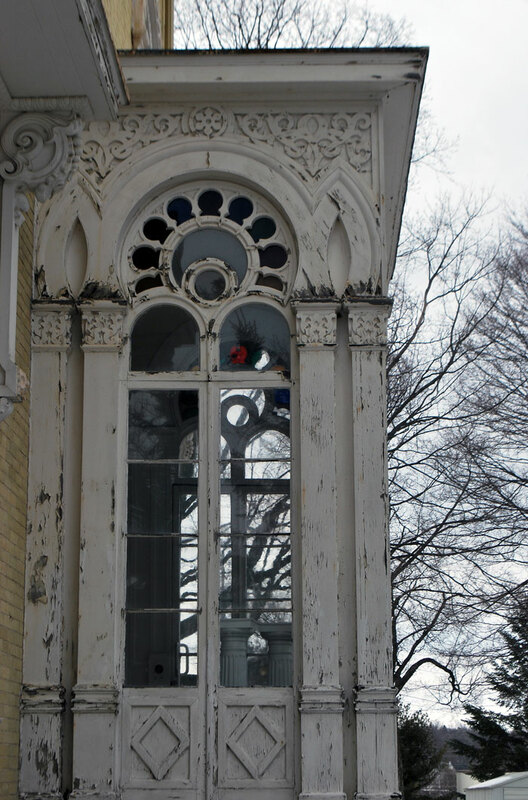 It was built in 1857 by William Morrison Tallman, a prominent lawyer and land speculator. 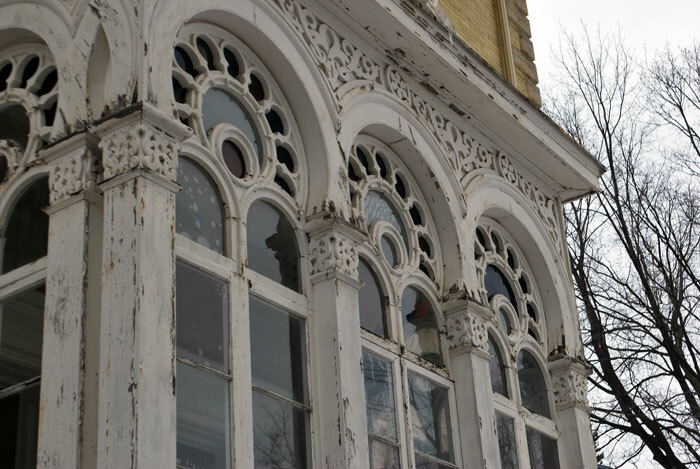 These windows are why I love old houses. Just look at them—does anyone still build architectural art as glorious as this?! It was a cold and icy day when I met with the RCHS committee. Afterward I slip-slid around the grounds and drooled over these beautiful buildings. I’m anxious to come back when they’re open and I can admire their interiors. 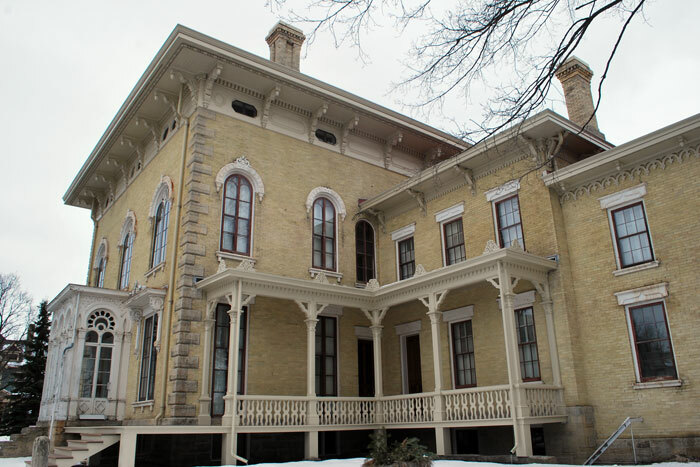 The RCHS describes the Lincoln-Tallman House as Italianate in style. Because Tallman was an abolitionist, many people believe it was a stopping point along the Underground Railroad. 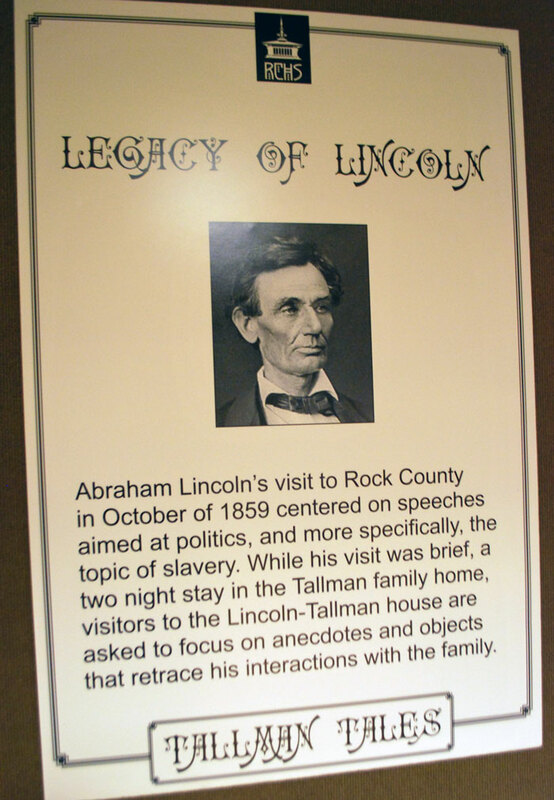 Interestingly, President Lincoln stayed here in October 1859 while he campaigned in Wisconsin for his 1960 election. Note the RCHS logo at the top of this document. Also note the period typeface the society uses in carrying out the Italianate style of the house. 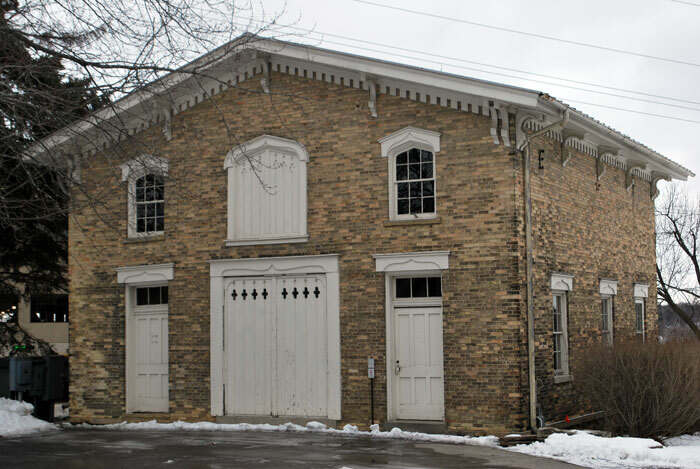 Even the Carriage House is beautiful. Look at the detailed door frames and rooflines! 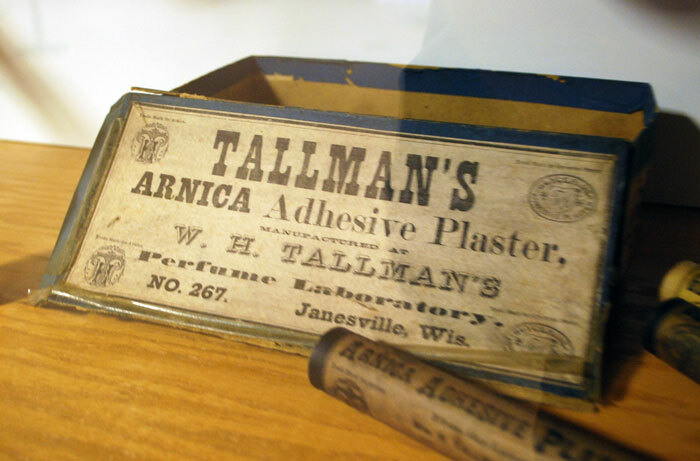 Tallman’s oldest son, William Henry Tallman, was an entrepreneur in the perfume business. These artifacts of his business are some of many showcased in the Helen Jeffris Wood Museum Center, a beautiful Craftsman-styled American Foursquare on the campus (of course, I’m a bit partial to Foursquares:-). The society did a super job of integrating an addition to this building, which also houses a gift shop and offices. 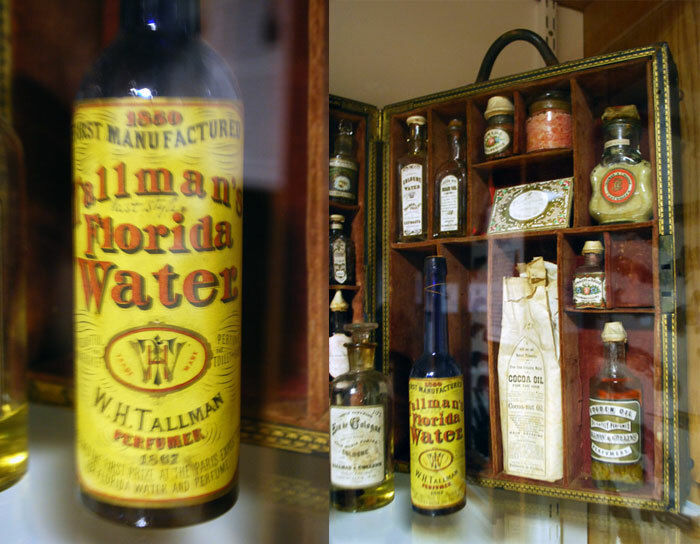 Along with perfumes, W. H. Tallman also produced flavorful food products. Aren’t the labels interesting? Color, type and style all exude the period of these products. Speaking of food…this brings me to our project. What a fun opportunity! The building is so cool looking – that should simplify your task as a designer! What great architecture! I pass through Janesville once in a while but never take the time to get off the main drag. Obviously, I need to do some wandering! I love when communities celebrate their histories. Everyone’s got something special and they need to let the rest of the world know. Thanks Ann. It is a cool building, isn’t it? The millwork alone is enough to base a logo design from! A lovely post, Diahann! As the son of the then-director of the RCHS I practically grew up in this house and wish it were better known! Thanks Dan! What fun you must have had as a child spending time in such a big and intriguing house. You must have developed a great appreciation for historic architecture! I didn’t realize these wonderful treasures were so close to home. I’d love to see the buildings in person and look forward to some nicer traveling weather. Thanks for all the great photographs Di!